Okay, before we get going too deep in this article, I want to point out something. Google is an independent thinker, no one truly knows everything about how their algorithm works, and we never will. I won’t, nor should anyone ever guarantee you results when it comes to SEO. With that said there are SOME things (not all) that are generally known to work well. 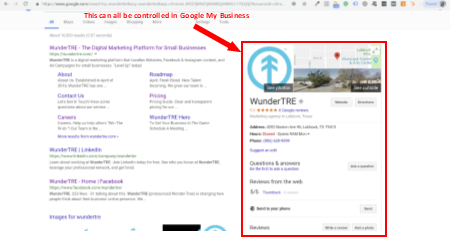 With Google My Business, you will be able to control the basic address and contact info, answer peoples questions, allow people to leave reviews and respond to them, and more. Google My Business is great for SEO purposes because not only does it let us give Google some vital ranking information, it also provides Google with an outlet to verify us. Yes, that’s right, you can get verified. Some of the features (such as updating photos, or managing reviews) can’t be done until you’ve been verified. Once you’ve been verified expect to start seeing your business profile show up when people search for your business. The lowdown: In addition to allowing you to control your profile in search results, having a GMB account also helps with general keyword SEO. It’s been my experience, and the experience of many other business owners and SEO experts I know, that when you have been verified and filled out your GMB profile, your business will start ranking higher for many keywords related to your business, not just for your business name. I’ve actually put together a whole guide on how to set-up a GMB profile, including going through the verification process. If you’re needing help, you can check it out here. Let me prove my point. If you’re reading this post now, you found it one of two ways. 1. Because you saw it on our social media channels, or 2. because you searched around the topic of SEO or getting found on Google, and then this post popped up, and you clicked it. If you’re here because of the latter, does that prove my point? If you’re blogging about the things your audience is searching for, you’re just setting yourself up to get found that much more. Every post you write gives you the opportunity to expand the keywords your business ranks for. Your five-page website can only cover so much, so blog posts help you cover more. Blogging is arguably the most SEO rewarding thing I’m going to write about today, but it also might take the longest to pay off. Don’t think it’s easy, it takes time to come up with good blog posts, and it takes time for them to get indexed on search engines. Another, the thing about blogging is you have to be consistent. You can’t post once and expect it to work for you the next day. It’s a grind; if you’re going to post once a week, post once a week. Don’t give up after a month; it could literally take six months or more of being consistent before you start to see any traffic. The lowdown: Blogging is awesome, it can be fun to write, and it gives us an outlet to get new content out to the masses that your website doesn’t cover. It can take time, and it can get boring at times, but it can be totally worth it if/when it pays off. Caution, this one can get you Google banned if you’re shady about it. Backlinks are enormous in the world of SEO. Some say they are the most significant ranking factor, I still say it’s blogging, but backlinks are high on the list. There are a lot of ways to do backlinks wrong, and really only one way to do them right, organically. The way to get good, natural backlinks is to get featured in blogs, news articles, etc. When you or your company are mentioned, make sure the people highlighting you link back to your website, this is how you get backlinks that are natural. Getting featured in articles isn’t necessarily as hard as it sounds. If your company does something noteworthy, try sending out a press release to the local news outlets. 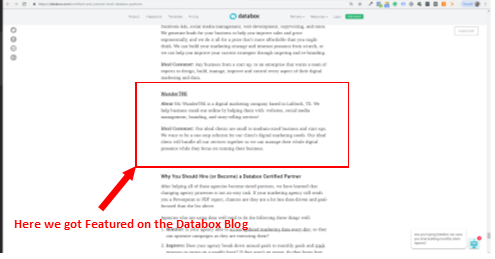 Connect with people on LinkedIn who’s roles are writing online publications that may be centered around your industry, then reach out to them and let them know you’re willing to contribute to an article should they ever need it. The lowdown: While getting natural backlinks is somewhat left up to luck, and not science. Its payoff can be big. There are lots of ways to get this wrong, NEVER pay for backlinks, even if it sounds legit. So this one is definitely on the more advanced side of things. You may have to be a nerd (like me) to pull this one off. If you find your business showing up towards the top of page 2 or bottom of page 1 on search results these are the things that can bump you up a few results. I’ve never seen someone go from page 6 to page 2 by doing this as I have with doing GMB or blogging, but I have seen them jump up a few results towards the top, when everyone around them was blogging, and using GMB. For the sake of readability, I’m going to break this section up into five parts. So when you’re blogging or writing copy for your website pages, it’s important to make sure you’re structuring content out correctly. If you’ve noticed when reading this blog, or others like it, we use subheadings. Notice each new element we’re covering in this post has a big title, that’s not just a bigger font, that’s using a subheading. Headings go from H1 to H6. Usually, H1 is the title of the page, you don’t want to use more than one H1. H2 thru H6 are subheadings, H2’s should be used to break up each main topic in a post or page, the H3 breaks up topics inside on H2, and H4 breaks up H3, and so on. Google bots look at what you make as headers and sub-headers and use that when determining your pages or posts structure, and what you as the author are giving weight too. Check out this guide for more info. Another thing that can separate you on SEO is adding Alt-Tags to your images. Alt-Tags allows Google to know what your images are in text form. Alt-Tags will enable you to add images that relate to your keywords and then get credit for them. Obviously, if you want to show up for specific search terms, you need to make sure you include those terms on your website. In the old days, people would spam add keywords to their sites copy, regardless of whether it fit in the sentence or not. Today, this practice will hurt you, your users need to have a good experience, and if you’re adding the keywords just for the sake of adding keywords, Google will punish you for it. Google bots are smart enough to look at how something is written and determine if it’s easy to read or not. Make sure when your adding keywords that your writing not only what people might type into a search engine, but also what they might say. The rise of voice searching is just going to get stronger, so make sure you’re optimizing for both. Back to the whole Google wants the end user to have a good experience if your site looks shady and it scares people when they get to it, you can bet you’ll suffer in the rankings. Getting an SSL certificate is a big step in the right direction. An SSL cert adds the padlock in the left-hand corner next to the URL on a users browser. This is a visual representation that your site is encrypted and that your site is doing the basic things to be safe. If you’re running a site on WordPress, I recommend installing the WordFence security plugin. It adds several security features to protect your site further. The lowdown: As you can see, there are several ways to optimize your content. To truly rank with the big boys in your industry, these “small” things are what you need to do. In a world where people are blogging, using GMB, and have good backlinks, Content Optimization is what will set you apart. Although it’s not always necessary, this is when you may want to have an SEO expert in your corner. I hope you’ve found value in this article and that the options I’ve laid out before you make sense. There are so many buzzwords out there about SEO and a lot of it is just noise. Remember, no one person or company knows everything about Google’s algorithm, there is no secret sauce, and if someone promises you results within a specific time-frame, run. I’ve helped businesses get on the first page of Google (at the top even) by using the techniques I’ve laid out, even still, I never tell them that I can guarantee them results. At the end of the day if you’re providing a great experience to your site visitors, making sure you’re writing valuable content, getting featured whenever you can, and just generally being authentic in you’re approach, is the best thing you can do for SEO.